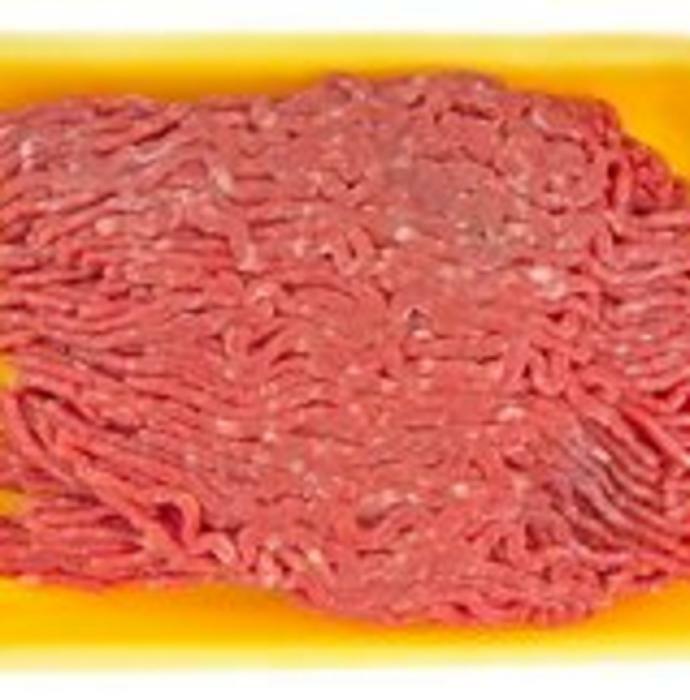 JBS Plainwell of Plainwell, Mich., is recalling approximately 43,292 pounds of ground beef. The products may be contaminated with extraneous materials -- specifically pieces of hard plastic. Denver Processing of Denver, Colo., is recalling approximately 13,865 pounds of raw pork and beef products. The products did not undergo federal inspection. California-based First Class Foods, Inc., is recalling approximately 34,373 pounds of organic ground beef products that may be contaminated with E. coli O157:H7, the U.S. Department of Agriculture's Food Safety and Inspection Service (FSIS) announced today. 16-oz. packages of "NATURE'S HARVEST ORGANIC GROUND BEEF BRICK" sold singly with one of the following "USE or FREEZE by" dates: "12/30/10" or "01/08/11." 16-oz. packages of "ORGANIC HARVEST ORGANIC GROUND BEEF BRICK" sold singly and in three-packs with one of the following "USE or FREEZE by" dates: "12/28/10" or "01/06/11." 16-oz. packages of NATURE'S HARVEST GROUND PATTY" containing four (4) 4-oz. patties with the following "USE or FREEZE by" date: "12/30/10" or "01/08/11"
According to the manufacturers, each package label bears the establishment number "EST. 18895" as well as the identifying Pack Date of "10341 and 10350 Julian date. The ground beef products in question were produced on Dec. 7, 2010, and Dec. 16, 2010, and were shipped to retail establishments in Calif., N.J., N.Y., N.C., Wis., and Wash. State. When available, the retail distribution list(s) will be posted on FSIS' website. According to FSIS, the problem was discovered through company microbiological sampling which confirmed a positive result for E. coli O157:H7. FSIS and the company have received no reports of illnesses associated with consumption of these products. However, individuals concerned about an illness should contact a physician. The products may be contaminated with extraneous materials. There have been no confirmed reports of adverse reactions due to consumption of the recalled products. 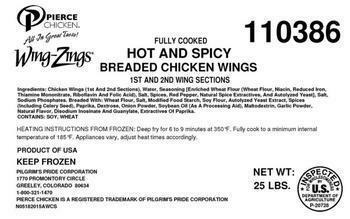 25-lb boxes containing 3 – 8.33-lb clear bags in a box of “Pierce Chicken/ Wing Zings Fully Cooked Hot and Spicy Chicken Wings 1st and 2nd Sections” with use by/sell by date of 09/15/2016 and a packaging date of 09/15/2015. The initial recall was issued in early April, with expansions in late April and mid-May. Consumers with questions may contact James Brown at (800) 321-1470. Upscale grocery Whole Foods has recalled fresh ground beef from all its stores after learning the meat could be tainted by E. coli. The meat was purchased from Coleman Natural Foods, but was processed at Nebraska Beef, which recalled more than five million pounds of ground beef in May and June. Nebraska beef recalled an additional 1.2 million pounds of beef produced in June and July, and that beef is included in the meat that found its way to Whole Foods. Last week Massachusetts health officials reported six people had gotten sick with the particularly virulent E. coli O157:H7strain. By the end of last week, that outbreak had been traced to meat purchased from Whole Foods stores. Whole foods began an investigation and contacted its meat supplier, Coleman Natural Foods. It was only then, the company says, that it learned the meat had originated at Nebraska Beef. The plant was already under close scrutiny by the U.S. Department of Agriculture. "We will continue to investigate to see what is happening at the plant to see what they have to do to get a handle on their food-safety issues," said USDA spokeswoman Laura Reiser. In early July USDA's Food Safety and Inspection Service took the unusual step of publicly criticizing Nebraska Beef's operation. The agency said the company uses production practices that "are insufficient to effectively control E. coli O157:H7 in their beef products that are intended for grinding. 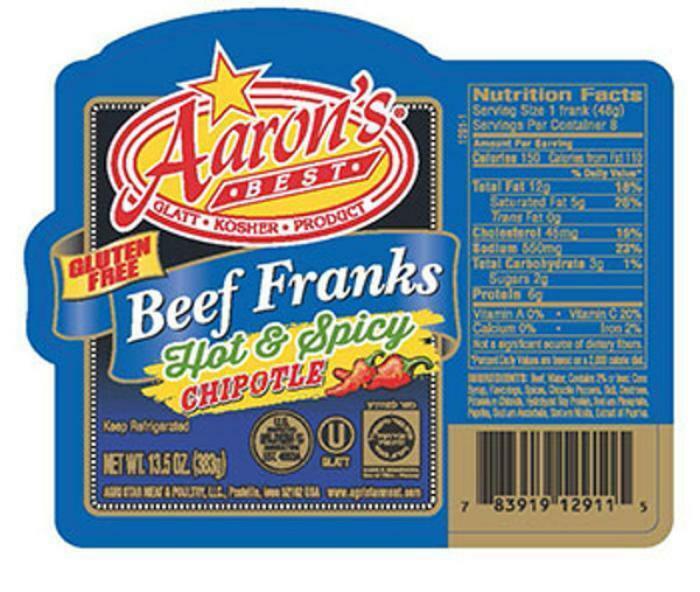 The beef that was ultimately recalled may have been produced under unsanitary conditions, the agency said. In a statement, Whole Foods said no beef secured from Coleman Natural Foods and sold between June 2 and August 6 is currently in any of its stores. It said its supplier had previously assured it than none of the recalled Nebraska Beef products were among the products it supplied to Whole Foods. "While Coleman Natural Beef is a relatively small supplier for Whole Foods Market, we are extremely disappointed that we must now question Coleman's assurances," said Edmund Lamacchia, global vice president of procurement. Whole Foods Market says customers who may have ground beef purchased beef from June 2 to August 6 to dispose of the product and return to the store with the packaging or receipt for a full refund. "At Whole Foods Market, one of our top priorities is consumer safety, and we go to great lengths to ensure the safety and quality of our meats," said Lamacchia. "We are currently cooperating with the USDA, the Massachusetts Department of Public Health and the Montgomery County Health Department in Pennsylvania as part of a routine multi-state investigation into these confirmed cases of E. coli 0157:H7 infection." The Massachusetts Department of Public Health issued warnings about the targeted beef. Whole Foods Market said it will continue to work with state and federal authorities as this investigation progresses. Agri Star Meat & Poultry of Postville, Iowa, is recalling approximately 1,690 pounds of beef products. The products may contain peanuts, an allergen not declared on the product label. There are no reports of adverse reactions due to consumption of these products. Consumers with questions may contact Yaakov Labowitz at (718) 440-0459. BMG Trading, of Oakville, Ontario, Canada, is recalling approximately 26,108 pounds of pork products. The product failed to present at the Canadian border for USDA reinspection and was distributed into U.S. commerce. The products were shipped to retail locations for further processing in Arizona. 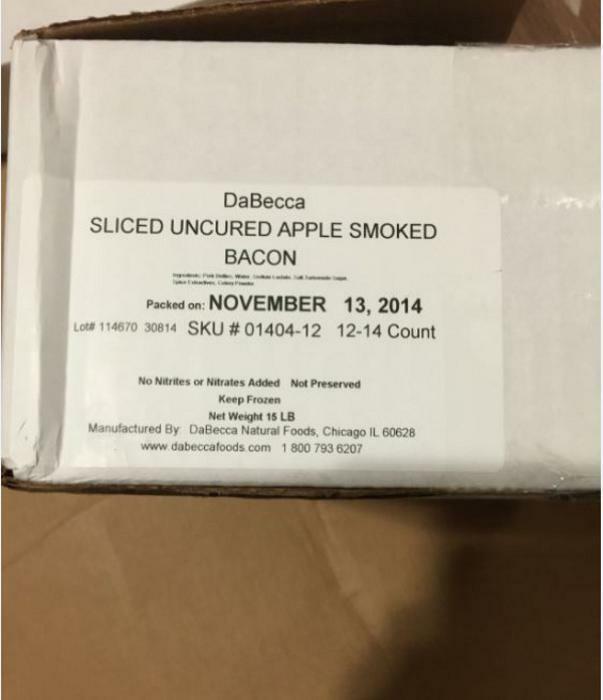 DaBecca Natural Foods of Chicago, Ill., is recalling approximately 3,450 pounds of bacon products. While produced under inspection, the products were packaged and shipped with labels that do not bear the USDA mark of inspection. The products were shipped to institutional distributors in California and Texas. Consumers with questions may contact Jon Pederson, director of operations at (800) 793-6207. 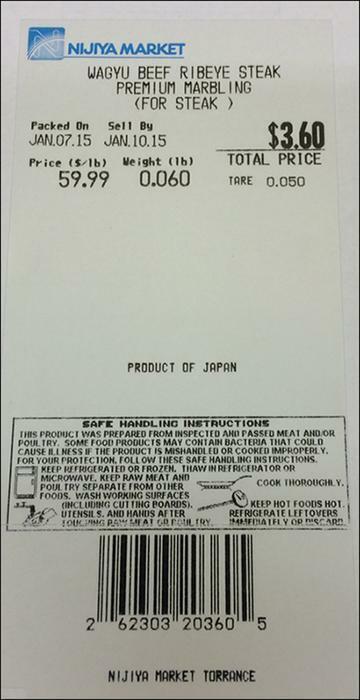 Nijiya Market of Torrance, Calif., is recalling approximately 359 pounds of frozen boneless beef products produced in Japan. The products were not presented at the U.S. point of entry for inspection, raising the possibility of adverse health consequences. These items were produced in Japan on August 6, 2014 and imported in September. The importer cut, repackaged and sold the products at a retail store in Torrance, California. Consumers with questions may contact Mitsuhiro Ueda at (310) 787-3305. 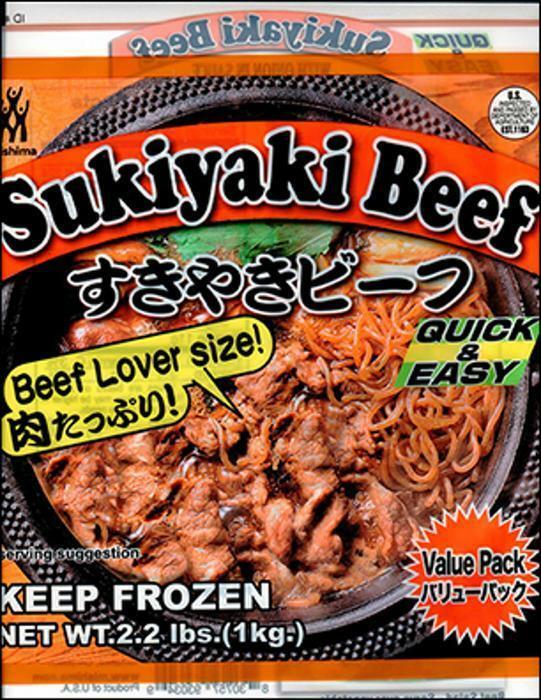 Unibright Foods of Bell Gardens, Calif., is recalling approximately 48,139 pounds of frozen, ready-to-eat sukiyaki beef and gingered pork products. The products may be contaminated with extraneous metal materials. There are no reports of injury or illness from consumption of the products. The beef product was produced between Aug. 12, 2014, and Dec. 16, 2014. The gingered pork product was produced between Aug. 5, 2014, and Aug. 6, 2014. Both were shipped to institutions and retail outlets in Arizona, California, Colorado, Hawaii, Illinois, New Jersey and New York. Consumers with questions may contact Jacob Fernandez at (562) 806-3221. US Foods of Blasdell, N.Y., is recalling approximately 700 pounds of beef product. The product contains peanuts, an allergen not declared on the product label. The product bears the establishment number “EST. 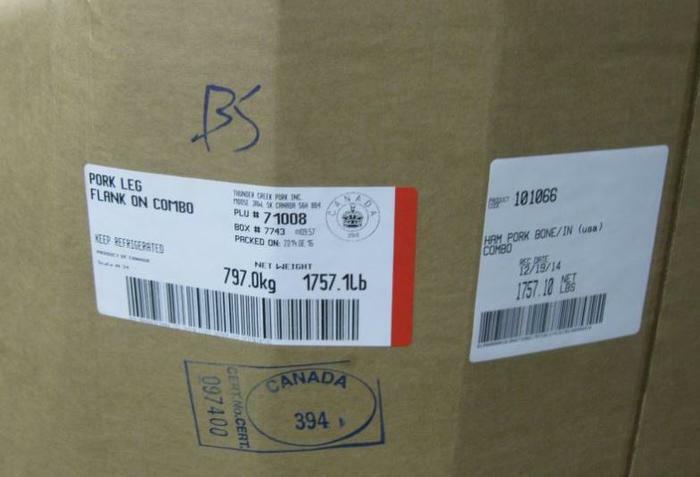 7817” inside the USDA mark of inspection, and was shipped to other US Foods divisions in Norwich, Conn., Peabody, Mass., and Buffalo, N.Y.
Consumers with questions may contact Roberto Bellavia at (773) 491-1411. Kanani Foods of Las Vegas, Nev., is recalling approximately 59 pounds of various chicken products. The products were not produced under a fully implemented Ready-To-Eat Hazard Analysis & Critical Control Points (HACCP) plan. There have been no reports of illness due to consumption of these products. The products bear the establishment number “P-46002” inside the USDA mark of inspection and “use by” dates of 6/30/14 – 7/4/14 on the package label. The products, produced June 24-30, 2014, were distributed for retail sale in Nevada. Consumers with questions about the recall may contact Timothy Cruz at 702-739-2800. Prime Pak Foods of Gainesville, Ga., is recalling approximately 23,250 pounds of fully cooked breaded chicken breast and tender products. The products were formulated with eggs, milk and wheat, known allergens which are not declared on the product label. Two 5-lb. bags in a 10-lb. box of “Wegmans Fully Cooked Breaded Chicken Breast Strips” with the product code “77064” printed on the box. Two 5-lb. bags in a 10-lb. box of “Wegmans Fully Cooked Breaded Chicken Breast Strips” with the product code “77065” printed on the box. Two 5-lb. bags in a 10-lb. 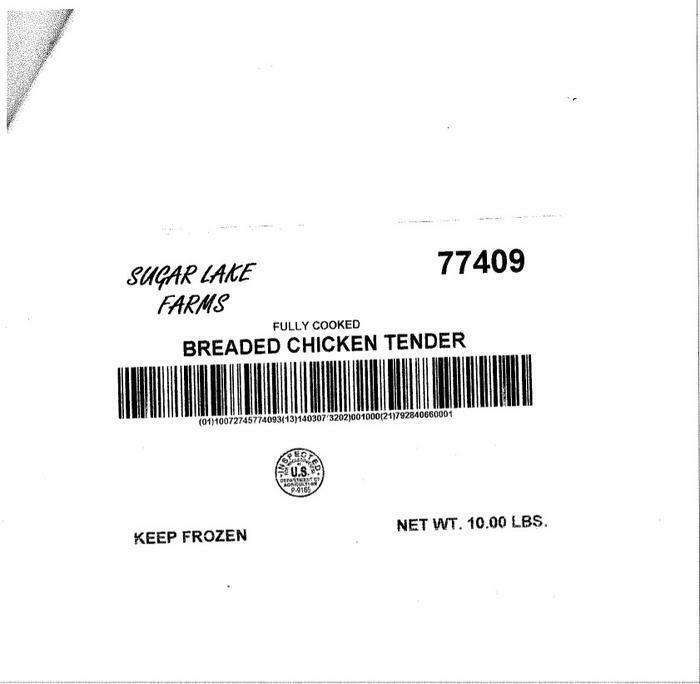 box of “Sugar Lake Farms Fully Cooked Breaded Chicken Tender” with the product code “77409” printed on the box. Two 5-lb. bags in a 10-lb. box of “Wegmans Fully Cooked Breaded Chicken Breast Fillets” with the product code “77425” printed on the box. 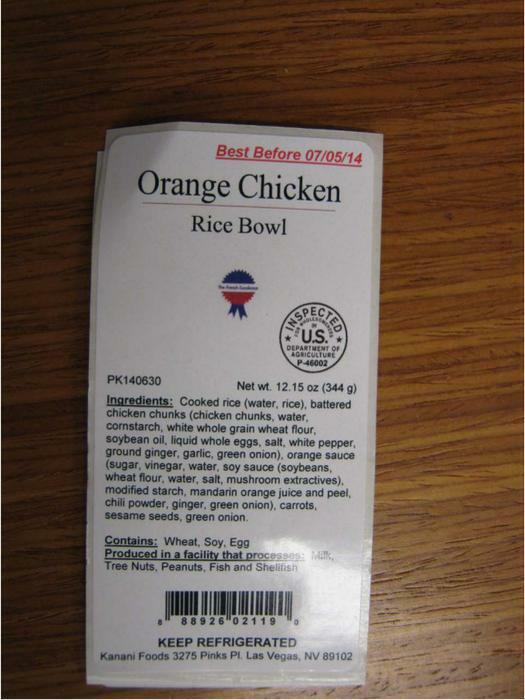 The recalled products were mislabeled by Prime Pak Foods and were not sold at Wegmans or other retail stores. They were distributed to hotels, restaurants and institutions nationwide. The products, produced from June 5, 2013, to March 21, 2014, bear the establishment number “P-9165” inside the USDA mark of inspection. Consumers with questions should contact John Appling at (770) 536-8708, ext. 1105, or by email at jappling@primepakfoods.com. Just in time for the holiday season, one of its busiest times of the year, HoneyBaked Foods, Inc., of Toledo, Ohio has recalled nearly 47,000 pounds of booked ham and turkey products. The company notified USDA's Food Safety and Inspection Service the meat may be contaminated with Listeria monocytogenes bacteria. • 6- to 11-pound packages of "SLICED & GLAZED FULLY COOKED HALF HAM." Each package bears the establishment number "EST. 15875" inside the USDA mark of inspection. Each label also bears a package code between "6261" and "6310." • 12- to 16- pound packages of "SLICED & GLAZED FULLY COOKED WHOLE HAM." Each package bears the establishment number "EST. 15875" inside the USDA mark of inspection. Each label also bears a package code between "6261" and "6310." • 3-pound approximate weight packages of "SLICED AND GLAZED COOKED BONELESS TURKEY BREAST." Each package bears the establishment number "P-15875" inside the USDA mark of inspection. Each label also bears the product code "30505 02099", as well as a package code between "6248" and "6258." • 3-pound approximate weight packages of "SLICED AND GLAZED FULLY COOKED SMOKED BONELESS TURKEY BREAST." Each package bears the establishment number "P-15875" inside the USDA mark of inspection. Each label also bears the product code "30504 02099", as well as a package code between "6248" and "6258." The ham and turkey products were produced between September 5 and November 13, and were sold at the company's retail stores and kiosks in the Toledo, Ohio, region, as well as through internet and telephone catalogue sales nationwide. HoneyBaked Foods Inc. has contacted catalogue sale customers who purchased products subject to recall. The problem was discovered through the company's microbiological testing. FSIS has received no reports of illnesses associated with consumption of this product. Consumption of food contaminated with Listeria monocytogenes can cause listeriosis, an uncommon but potentially fatal disease. Healthy people rarely contract listeriosis. However, listeriosis can cause high fever, severe headache, neck stiffness and nausea. Listeriosis can also cause miscarriages and stillbirths, as well as serious and sometimes fatal infections in those with weakened immune systems, such as infants, the elderly and persons with HIV infection or undergoing chemotherapy. Consumers with questions about the recall should contact company Customer Service Hotline at (800) 461-3998. Sensenig Turkey Farm of Lititz, Pa., is recalling approximately 1,925 pounds of turkey sausage. The product contains wheat and soy, allergens not declared on the label. 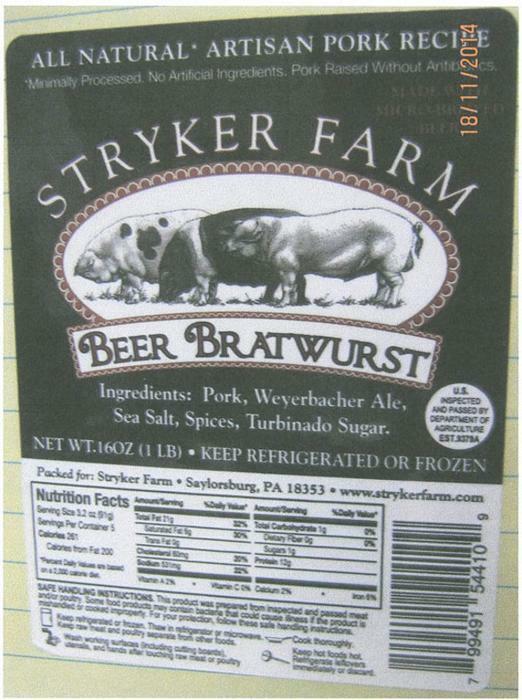 K. Heeps of Allentown, Pa., is recalling approximately 2,902 pounds of bratwurst and bangers sausage products. The products contain soy lecithin; a releasing agent used on contact surfaces during production and an allergen not listed on the label. The products were packaged on various dates from May 21, 2014, through Nov. 5, 2014, bear the establishment number “EST. 9379A” inside the USDA mark of inspection, and were sold to a single vendor, who further distributed them to restaurants and retailers in Pennsylvania. The problem was discovered during a periodic label review by FSIS inspection personnel. This was not disclosed on the product label. FSIS and the company have received no reports of adverse reactions due to consumption of these products. Anyone concerned about an injury or illness should contact a healthcare provider. FSIS routinely conducts recall effectiveness checks to verify that recalling firms have notified customers and taken steps to make certain that products are no longer available to customers. Consumers with questions about the recall may contact Beau Heeps, at qa@heeps.com or at 1-610-530-5564. Ranchers Legacy Meat Co., of Vadnais Heights, Minn., is recalling 1,200 pounds of ground beef products. The meat may be contaminated with E. coli O157:H7. There are no reports of illnesses associated with consumption of these products. The recalled products, produced on Nov. 19, 2014, are packaged in plastic cryovac sealed packets, and contain various weights of ground beef. Consumers with questions regarding the recall may call Jeremy Turnquis at (651) 366-6575.